You have all heard about Robert Ripley....as you know, he was an expert on freaks and spent his lifetime gathering together the most outstanding human curiosities from all over the world. For many years this young man was the feature attraction with Robert Ripley, and during the years....Ripley and X became the closet of friends. Ripley became so attached to X that he made provisions in his will to care for him the balance of his lifetime. He did this in the form of printing plates....no....not for a famous book about Robert Ripley....during the lifetime of Ripley he became famous for his endeavors to rind the most unusual ..... not only people, but things as well. 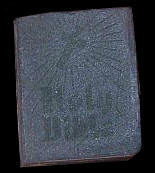 One of Ripley's most prized possessions was the plates for the pricing of the smallest bible in the world. In his will, Ripley left X these plates....because Ripley know that as long as X had these plates, he would never go hungry as long as he lived. I'm certain that it goes without saying that you all understand that X could never serve you food in a restaurant, he could never full your gas tank as a service station, and you would never buy insurance from him.... The only type of work he can obtain is by exhibiting himself a freak show. X receives no salary for being in this show. 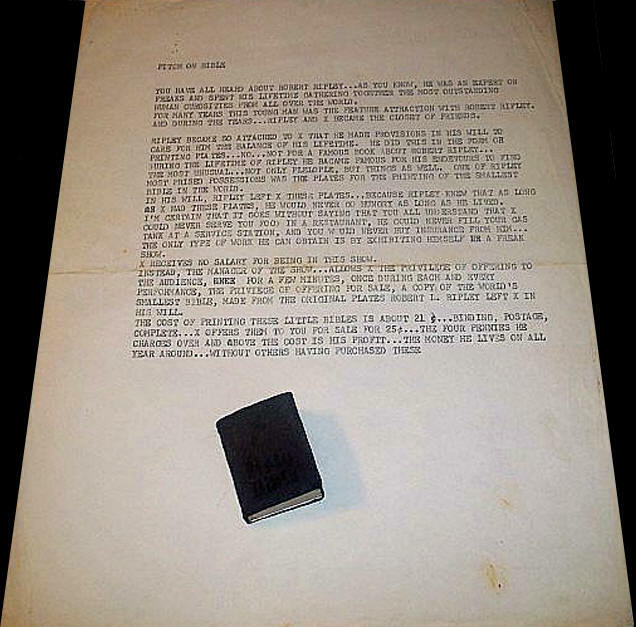 Instead, the manager of the show....allows X the privilege of offering to the audience, for a few minutes, once during each and every performance, the privilege of offering for sale, a copy of the world's smallest bible, made from the original plates Robert L. Ripley left X in his will. The cost of printing these little bibles is about 21cents....binding postage, complete....I offer them to you for sale 25cents....the four pennies he chares over and above the cost is his profit....the money he lives on all year around....without others having purchased these.